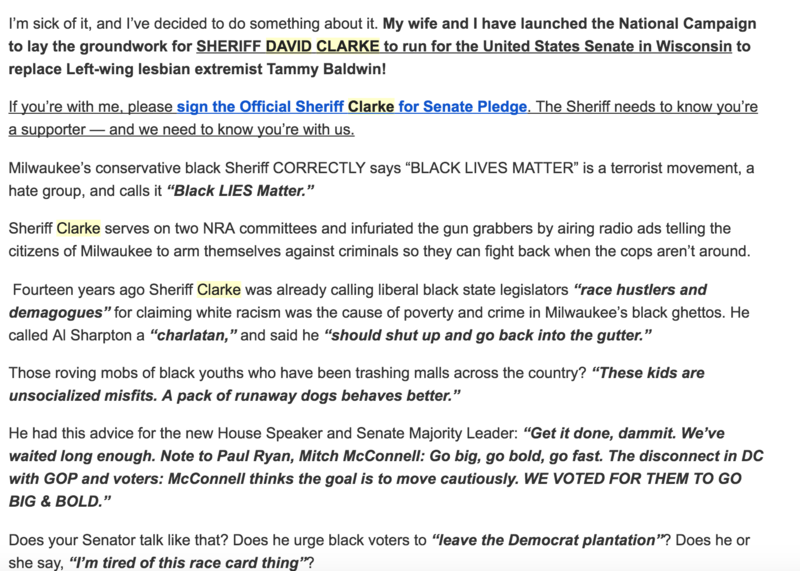 Milwaukee County Sheriff David Clarke never acted like a man who was going to run for Senate in 2018. He never formed an exploratory committee. There were no reported meetings between Clarke and the Republican donors whose help would be needed for such a bid. There were none of the telltale signs of a political figure considering taking a career-changing gamble. In fact, it was the opposite. But third-party actors unaffiliated with Clarke told an entirely different story to thousands of grassroots Republicans: Clarke isn’t just going to run, he’s going to win, they said — if you give us enough money to convince him. Clarke may not be running for Senate, but a whole lot of small-dollar donors gave money that they were told would help him win. And unlike the handful of wealthy donors who usually fund super PACs, individual small-dollar donors wield virtually no influence over how the PAC spends their money. At the same time Clarke’s book was hitting shelves, operatives with several super PACs were using Clarke’s name to ask grassroots Republicans for money. The Milwaukee Sentinal-Journal noted that at least four shady, out-of-state political groups were asking voters to fund a non-existent Clarke run for Senate. The PACs weren’t affiliated with Clarke, but their operatives gave potential small-dollar donors the impression that their money would help Clarke defeat Democratic incumbent Tammy Baldwin in 2018. The largest and most successful of those PACs was the Draft Sheriff David Clarke for Senate PAC, which was founded by Jack Daly, a less-than-well-known political operative. The PAC’s board members include reality TV star Duane “Dog the Bounty Hunter” Chapman. In its first month of operation, the PAC received more than $300,000 from 5,886 donors, Daly told the Milwaukee Journal Sentinel in February — roughly $50 per donor. The vast majority of the PAC’s funding, Daly told TheDC, has gone towards fundraising and ad campaigns. Email lists are valuable to PACs in two ways: it’s an easy way to ask known supporters for money, and it allows them to loan out those names and email addresses to other PACs — for a price. Political organizations will often dish out tens of thousands of dollars for access to ready-made email lists of potential donors. Eberle’s website tells potential clients that their candidate needs to “take strong stands on emotional or controversial issues” for a successful direct mail operation, later adding: “Unless your appeals use techniques that ‘command’ a response and unless they use emotional, ‘now-or-never’ phrases constructed from simple, everyday words, don’t expect them to succeed. It’s not going to happen.” True to form, Daly’s PAC made emotional appeals when asking for Clarke supporters’ money. 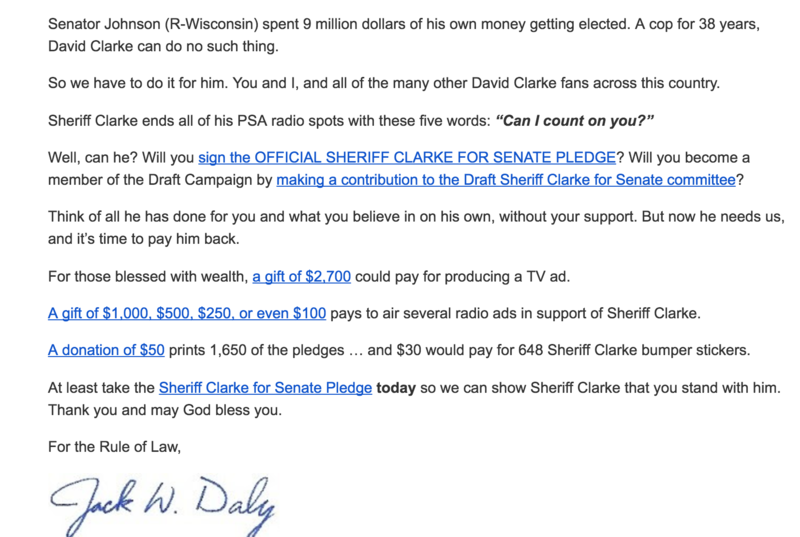 Daly’s PAC has used Stars and Stripes’ email list — which numbered in the hundreds of thousands as of last year — at least twice, encouraging conservatives to donate to the PAC and sign the pledge to support Clarke. “As I hear occasionally from my long-suffering wife, I have actually lost many thousands of dollars on this endeavor,” he claimed, adding that he has another full-time job in addition to his work for the PAC. Today, more than 20,000 donors have given to the PAC, Daly told TheDC. (He prefers to use the term “patriots” instead of “donors.”) When asked by TheDC, Daly said he would share neither fundraising figures nor spending numbers before the July 31 semi-annual filing, out of concern that Baldwin would use the figures to motivate her Democratic donors. Daly told TheDC that he will be “disappointed” if Clarke, who has said he’s not running for Senate in 2018, doesn’t run for Senate in 2018. “But the contributor and volunteer lists we develop for Sheriff Clarke and the research into Tammy Baldwin’s sickening voting record will certainly have tremendous value to whoever the eventual GOP nominee is. No one has done the kind of job we have uncovering that woman’s record of extremism,” Daly claimed. Clarke, age 60, has given zero indication that he will run for Johnson’s seat when it opens up — in 2022. Even if Daly hasn’t paid himself any money, and even if he stops pressing small-dollar donors for their money — which he’s given no indication is the case — he can still capitalize by renting out his email lists to other organizations seeking donors. FEC filings show that when The 2016 Committee (the pro-Carson PAC) was still in its “draft Carson” stage in 2015, the PAC received nine payments between $9,000 and $40,000 for renting out its list through direct mail organizations. As the PAC grew, so did the payments from renting out its email lists. Direct mail organizations paid the PAC more than a dozen times in 2016, with the largest payment topping out at $133,605. Daly’s PAC will be able to similarly cash in by renting out its lists to other organizations. In a phone call with TheDC after this story was published, Daly indicated that his PAC is likely to rent out their email list to other organizations. 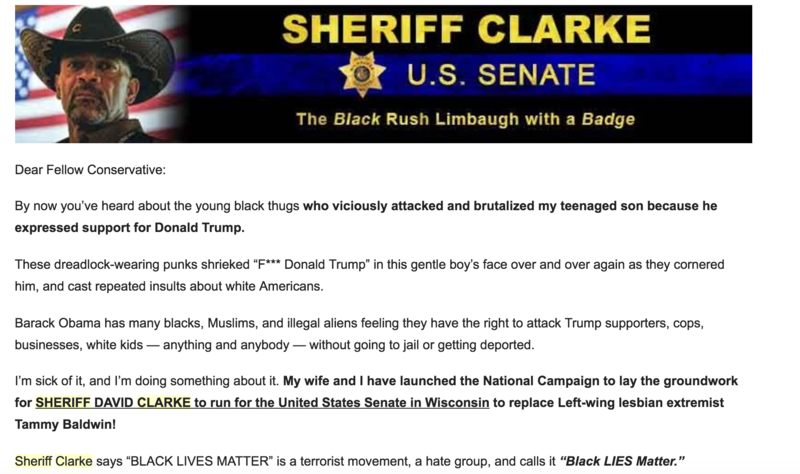 This article has been updated to include Sheriff Clarke’s confirmation on “Fox & Friends” that he had no plans to run for Senate, as well as Daly’s confirmation that the PAC is planning on renting out their email list.